The passage of the Every Student Succeeds Act (ESSA) presents unique challenges and opportunities for states with respect to how they select and use high school assessments. States are now facing important decisions about which high school assessments to administer, what content these assessments will measure, and how these assessments will factor into their new accountability systems. Achieve has produced two new briefs exploring these issues with the goal of equipping policymakers to make informed decisions about assessment that ultimately advance the goal of graduating all high school students ready for college and career. 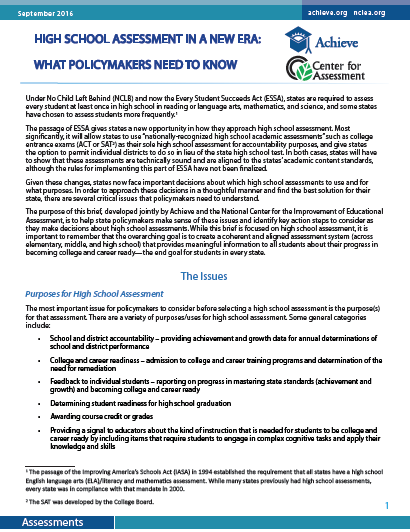 Achieve and the National Center for the Improvement of Educational Assessment partnered to develop this brief to help state policymakers make sense of what testing options exist and identify key action steps to consider as they make decisions about high school assessments. 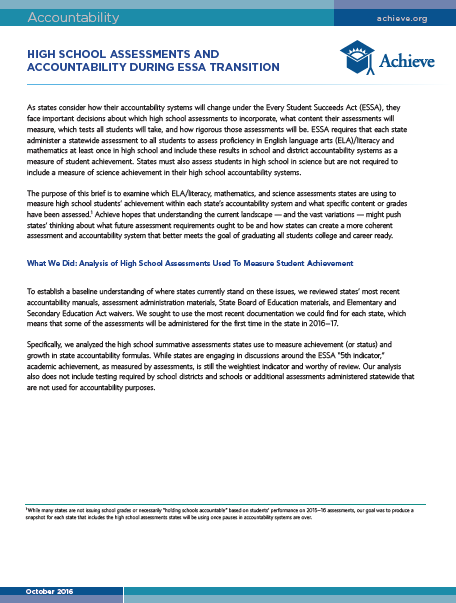 This brief is a national perspective on the ELA/literacy, mathematics, and science assessments states are using to measure high school students' achievement within each state's accountability system and what specific content or grades have been assessed. Achieve hopes that understanding the current landscape - and the vast variations - might push states' thinking about what future assessment requirements ought to be and how states can create a more coherent assessment and accountability system that better meets the goal of graduating all students college and career ready.